Spoiler alert! You can download a free ‘Festive Campaigns Guide’ to inspire your marketing strategy. The holiday season is fast approaching and it is the biggest chance for businesses to boost their revenue. Consumers are expected to spend about a trillion dollars between November and January, so if you haven't incorporated a proper marketing strategy to boost your sales for it, you're already falling behind. Make sure you have a campaign strategy for both your online advertising and email marketing, as they are both essential channels to increasing sales over the period. Social activities are a must! Get in front of your audience where they already spend the majority of their time, and engage with them with beautifully ads that they can’t miss. your commercial offer shouldn’t be left behind. Interactive commercial content is the answer to your business’s success this year. It is bold, fun to interact with, and creates a memorable experience that positions your brand as innovative. All that without compromising on your true objective – increasing revenue. Making assumptions about how your audiences feel and what they want or need, can result in expensive and even damaging campaigns that squander opportunities to foster brand loyalty and boost sales. Using Interactive Commercial Content you can ask your target audiences questions through image-based quizzes, with bespoke Call-To-Actions. This allows you to gather 1st party data, actual user preferences and behaviours without compromising revenue goals. Did you know... During October 2016, the amount spent on all Halloween goods across the retail industry was £30.8 billion, a 6% increase on the previous year. Brits spent an estimated £277 million on Halloween treats alone in 2017! The COSTUME BUILDER brings a unique brand interaction delivering a memorable experience. With Phenomenal engagement rates, audience segmentation by product/preference and outstanding conversion rates. Did you know... A whopping £1.4bn was spent on online sales in the UK on Black Friday - up some 11.7% on last year, according to online retailers trade body IMRG. 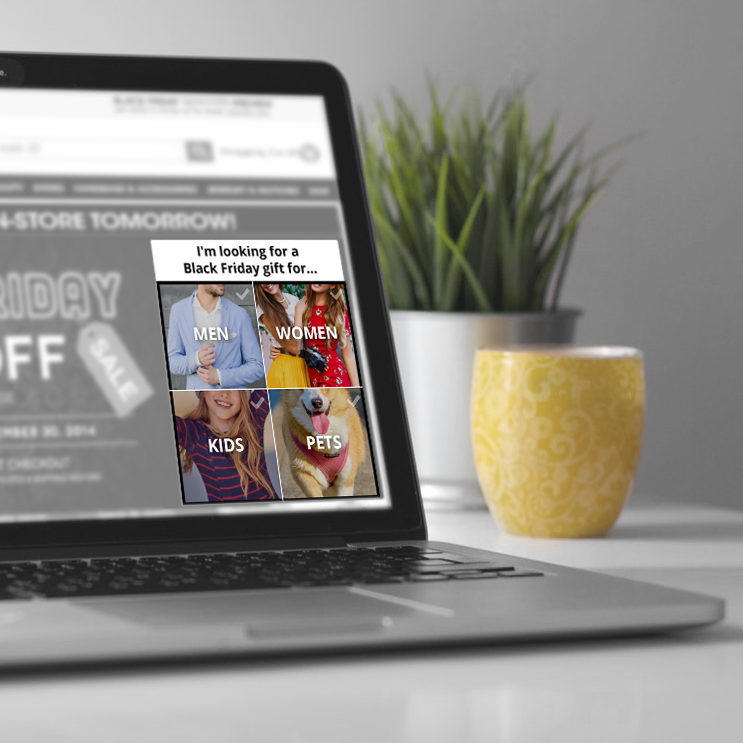 The DEAL FINDER delivers Black Friday deals across the internet in an interactive ad unit with phenomenal performance stats. Black Friday 'Deal Finder' - click image for live demo! Did you know... Retail sales for Christmas 2017 grew 1.4% against 2016 to a whopping £78.69 Billion (mid Nov – end Dec). The GIFT WIZARD and MUSICAL EXPERIENCE deliver a unique and memorable brand interaction. Get actionable insights about your audience in real time and high performing audience segments. 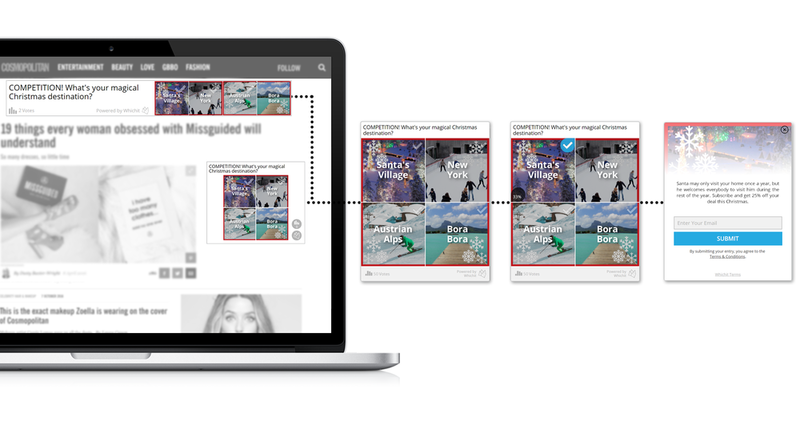 The interactive content can easily integrate with client e-commerce engines to auto-fill baskets directly from the ad unit! No additional steps or landing pages needed. Boxing Day 'Bargain Finder' - click image for live demo! Did you know... 2017 Boxing Day bargain hunters spent a record £4.5billion! Web sales hit £1.03billion, topping £1billion for the first time and up 7.9 percent on the £954million spent in 2016, according to Centre for Retail Research. The BOXING DAY BARGAIN FINDER delivers your boxing day bargains direct to consumers even before the event. It presents a unique opportunity for consumers to select multiple sale items they want from 1 interactive ad unit. Gather actual consumer preferences and behaviour that can be used to build new audience segments. Enjoy this new customer acquisition and increase sales this season. Brilliant creatives and personalized offers to your customers make a huge impact, and can strengthen the consumer-brand relationship, turning a happy customer into a brand ambassador. Now, make all of your holiday marketing dreams come true! Merry Christmas! And don’t forget to follow us on Twitter and Facebook for more inspiration and marketing tips.